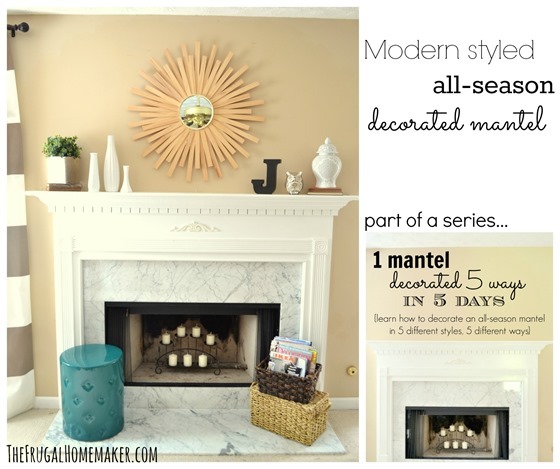 Today I am sharing more of a modern/contemporary/clean version of an all season decorated mantel. At least as modern as this non-modern girl can get! Simple, more sleek accessories. 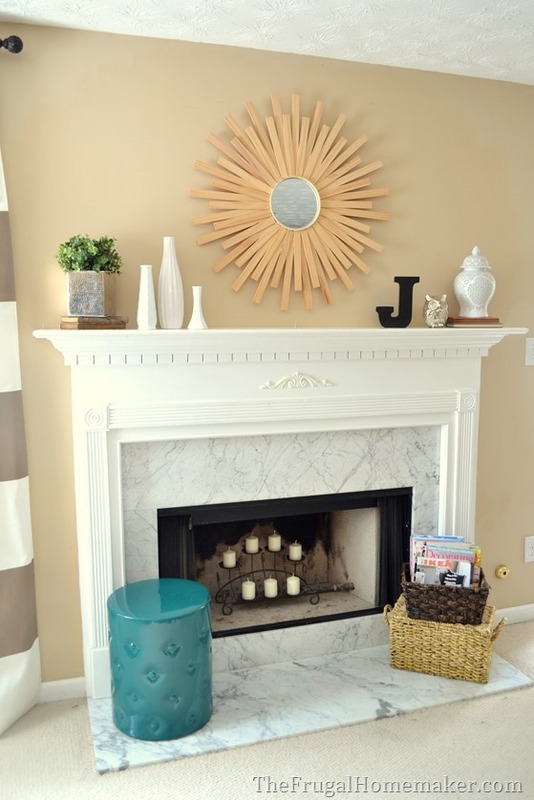 I left the hearth very simple with some baskets for magazine storage and a more modern looking garden stool. 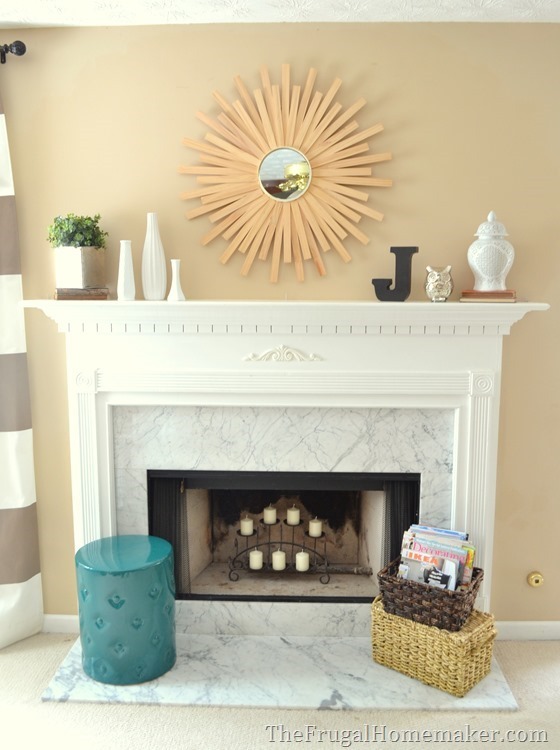 Then a sunburst mirror (tutorial for that here) as the focal point with a few accessories on the side. 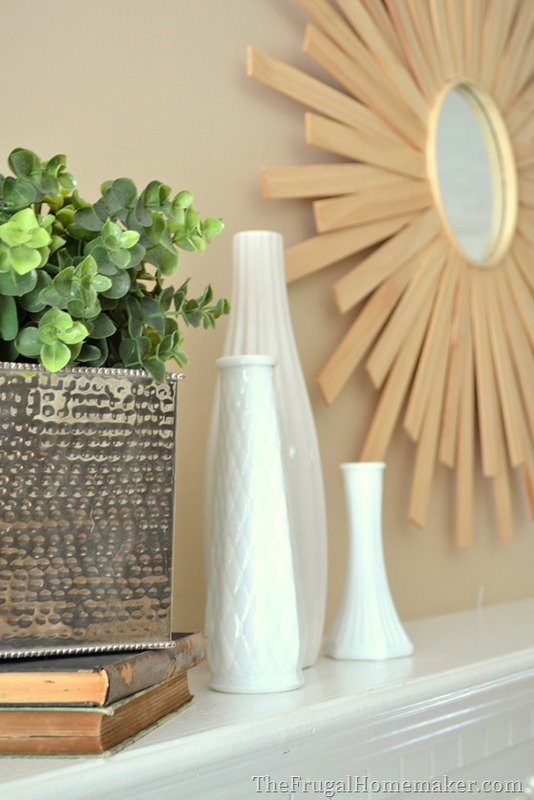 A plant in a hammered metal container and a collection of white vases for some sculptural interest. Then another urn for some sculptural, a mercury glass piece to balance the metallic on the other side and another sculptural art piece in the J. Again, my style is not very modern or contemporary and I am just pulling from things I have in my house. 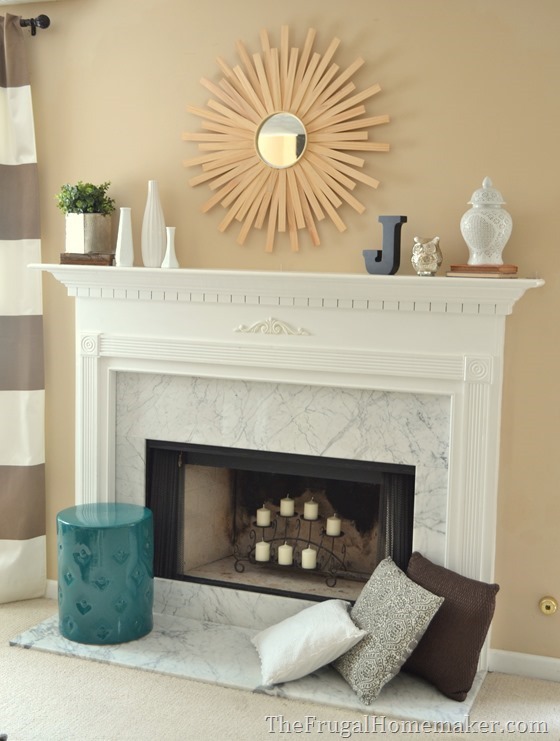 There are much more modern/contemporary pieces out there that would make this mantel look even more modern. See that hammered metal container? It is actually a Kleenex box cover turned upside down! Sometimes you have to think outside the box (or upside down in this case ) with yard sale items. 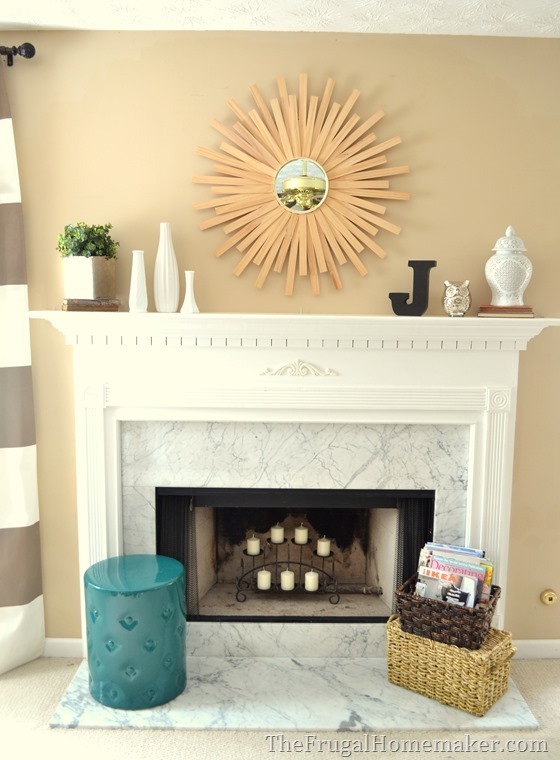 I can also see this mantel styled with some big floor pillows on the floor too sort of like this. Do you have modern/contemporary style? 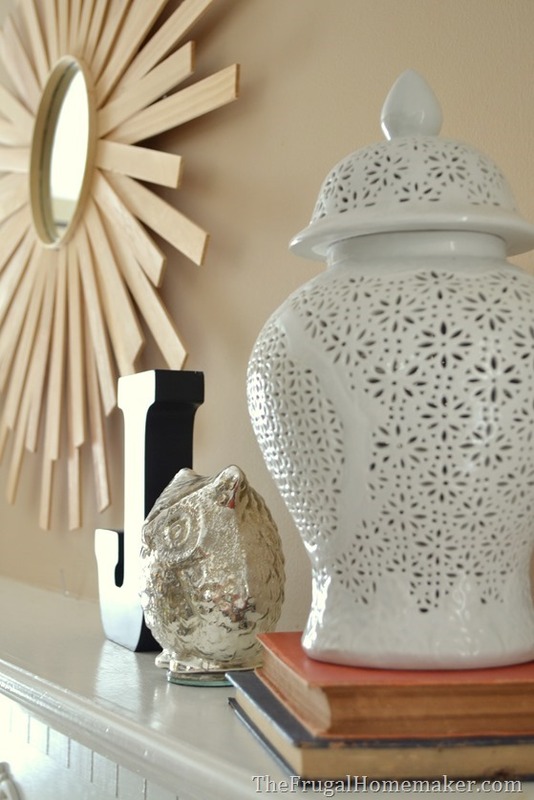 How do you decorate your mantel? Don’t forget to come back tomorrow for mantel #3! Love it! Nice touch with the Ikea catalog in the basket. 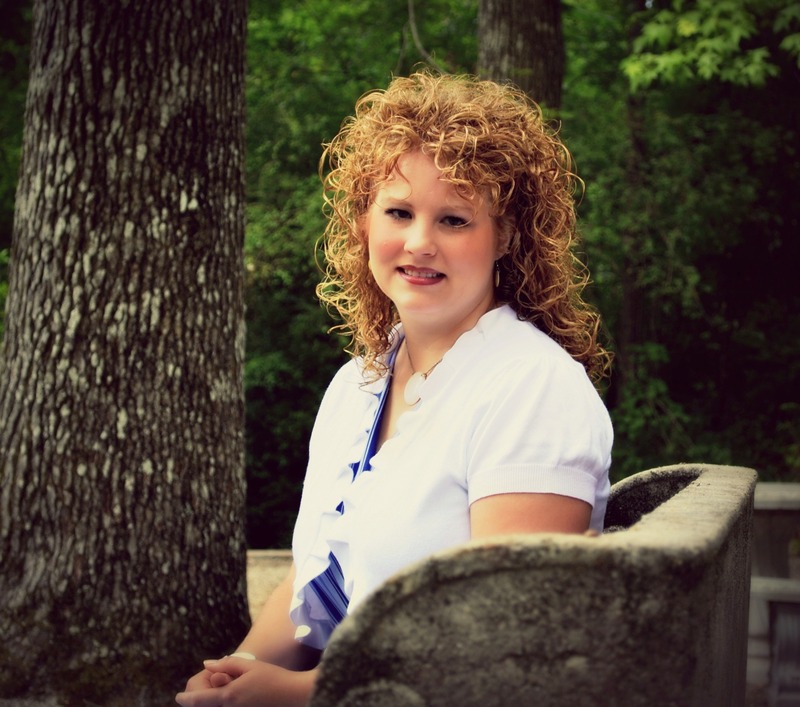 Looks great Christina! Love that hammered metal kleenex box and love that you used for something other than what it was intended for! Hey, I’ve seen something like that white urn before. I think it is a ginger jar. The holes are to let the ginger breathe.